This post may contain affiliate links. For more information, read my disclosure policy. Apple Fritter Pancakes are FULL of grated apples and they’re the perfect fall breakfast. Made with PROTEIN pancake mix, they fill you up too! Breakfast is always so difficult in my house. I really want to give Jordan something that will keep her full and not be pure sugar, but she does not want eggs or bacon in the morning. She wants cereal or occasionally pancakes, but most likely, it’s cereal she wants. If only she liked bran flakes or shredded wheat, but no, she wants sugary cereal. Luckily I have her trained to reach for honey nut o’s (and occasional I treat her to a kid cereal) but I feel at least a little okay that the o’s are made with whole grain and not as much sugar as her favorite cereal (that’s also full of marshmallows). The one thing missing from cereal? Protein. I really don’t think she gets enough during the day. She doesn’t like protein that much; she’s not into meat or beans and cheese is just okay if it’s grilled inside bread. The apple doesn’t fall far from the tree because I’m kind of the same way. I’ll eat salad or veggies or fruit at lunch and dinner but throw in meat and I just don’t want it. Since I’m an adult I eat it because I know I need it and it’s good for me, but she’s a kid…and a stubborn one at that. Every once in a blue moon she asks for pancakes. (And, mind you, if she hasn’t asked for them and I make them anyway she skips them and moves onto cereal.) 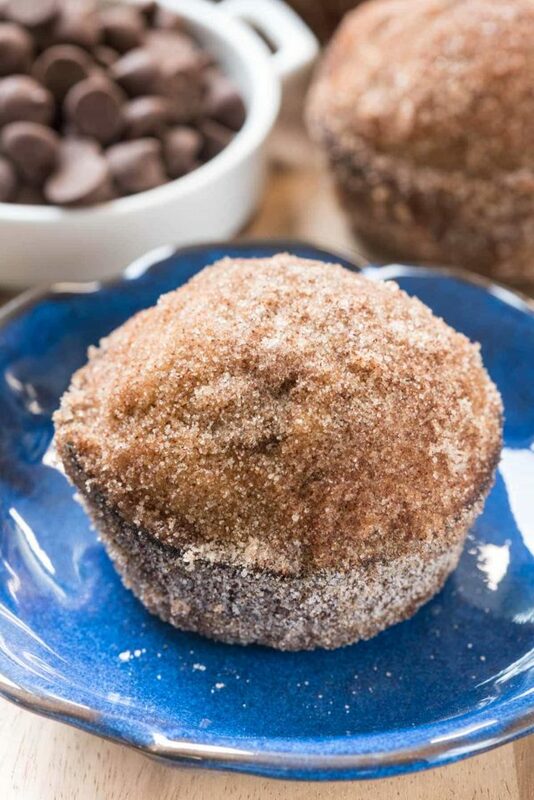 When she does I want to make them as healthy as I can because if muffins are cupcakes without frosting, pancakes are cake without glaze…unless they’re apple fritter pancakes, that is. Wait a minute, you say. Apple Fritter Pancakes are not in any way a better breakfast choice…or are they? Yes, my friends, they are! 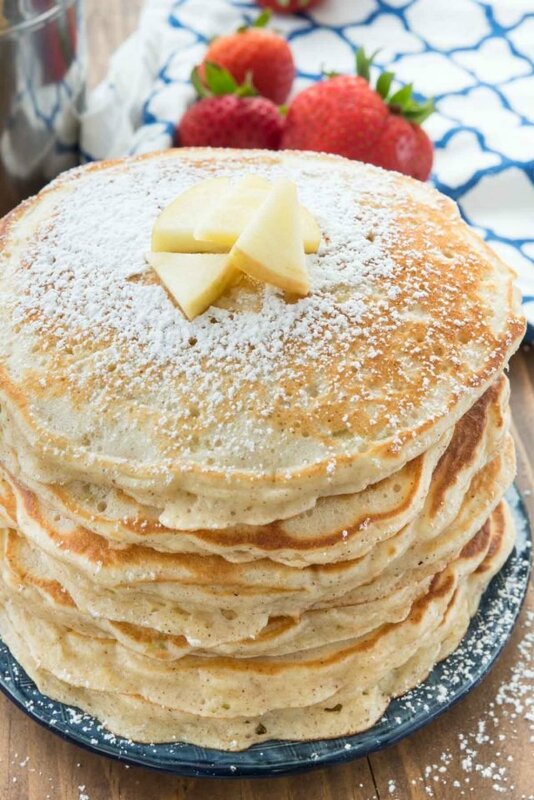 Apple Fritter Pancakes are an easy pancake recipe that start with a protein pancake mix and have apples grated right in. They’re sweet enough to eat without syrup! Back when Jordan was a kid she learned that if she dunks her pancakes in syrup she can make the pancake to syrup ration tip to the syrup side of the balance. At that point I realized that I needed to try and do away with syrup if I could, which is why I started putting sprinkles inside pancakes. The sprinkles added crunch and sweetness – no syrup needed. That worked for years…and now I’ve done it again with apple fritter pancakes! 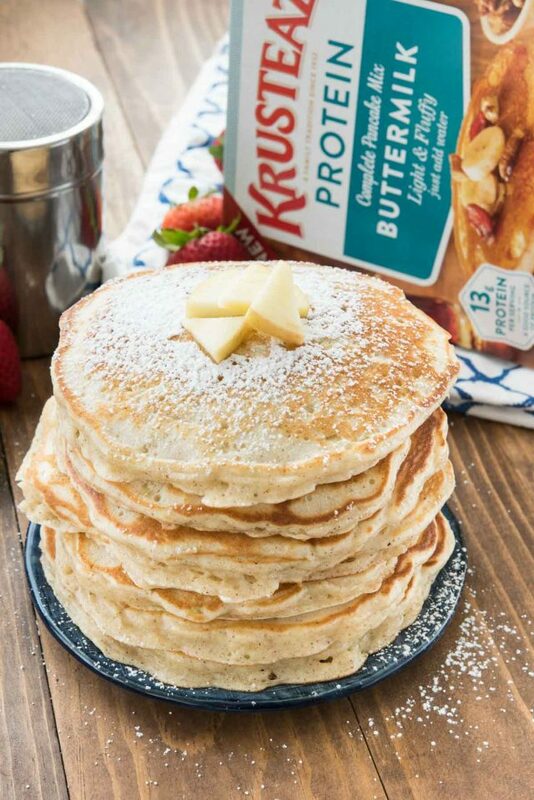 These pancakes start with a new Krusteaz pancake mix: Krusteaz Protein Complete Buttermilk Pancake Mix. These pancakes pack a protein punch of up to 13g per serving. This is a pancake mix I can feel good about because at least it has more protein than that bowl of cereal Jordan usually eats. Another reason to feel good about these apple fritter pancakes is because I grated the apple right in. 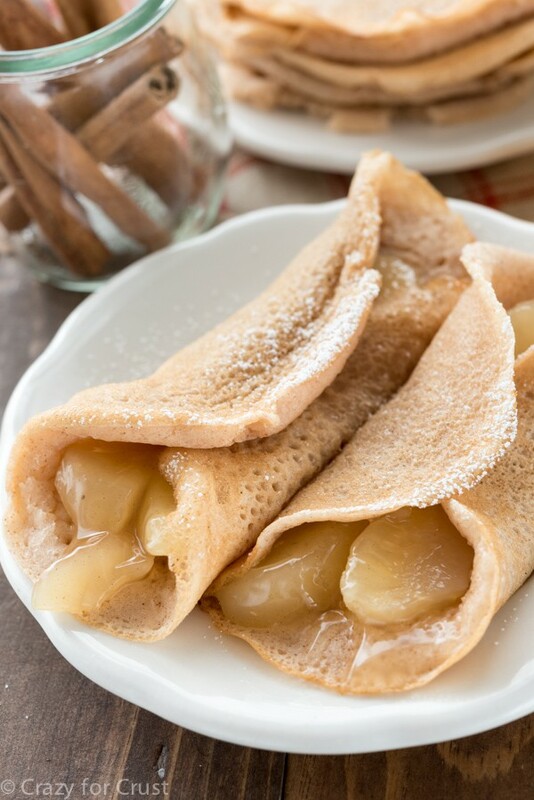 The grated apples are thin enough they cook right into the batter and they add a sweetness to the pancake. Dust it with powdered sugar and you have an easy pancake recipe that’s even good for on the go! Use your favorite kind of apple. I used a Gala apple. Leave the skin on when shredding the apples; they’re healthier that way! These are great for on the go because they don’t need syrup! Freeze pancakes in bags of 2 for a quick morning breakfast the kids can reheat themselves! 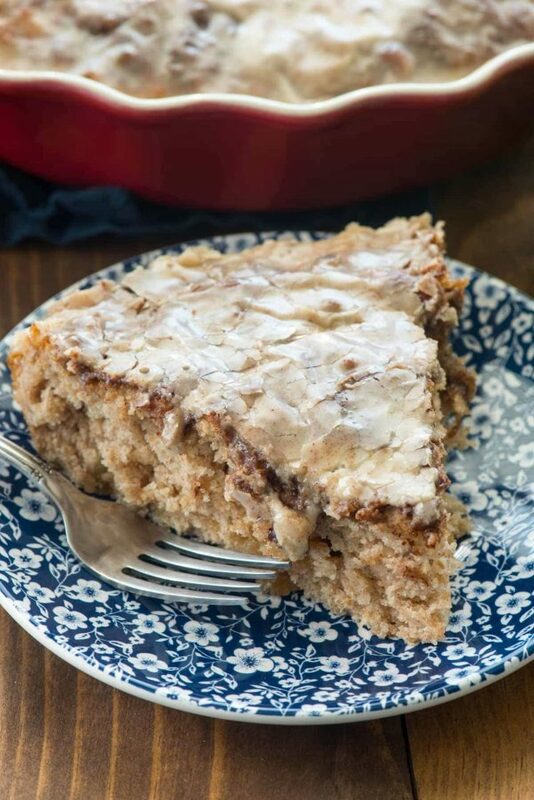 Find this recipe also on the Krusteaz website. Apple Fritter Pancakes are FULL of grated apples and they're the perfect fall breakfast. Made with PROTEIN pancake mix, they fill you up too! Preheat griddle to 350°F. Spray with nonstick cooking spray or spread with melted butter. Whisk pancake mix, milk, eggs, powdered sugar, and cinnamon in a large bowl. Stir in grated apples. Drop batter in desired size onto prepared griddle and cook until both sides are browned. Serve warm with a dusting of powdered sugar and/or maple syrup. All text and images © Dorothy Kern for Crazy for Crust. Please do not use my images without prior permission. If you want to republish this recipe, please re-write the recipe in your own words, or link back to this post for the recipe. Disclaimer: Nutrition information shown is not guaranteed to be accurate. Click here for more Brunch Recipes! This post has been sponsored by Krusteaz. All opinions are 100% my own. This is such a great idea! Wow, these look good. YUM! hey girl- these pancakes look so yummy!